Experience life in the "past" lane when you stay in one of the classic campers at The Starlite Classic Campground, located near the gorgeous Royal Gorge in Colorado. Camp owners Sylvia Davids and Larry Hill (of Retro Restoration) are experts in restoring and collecting classic campers, and have chosen some of the best to share at their park. Who could forget the hilarious antics of Lucille Ball and Desi Arnaz as they traveled in "The Long, Long Trailer"? 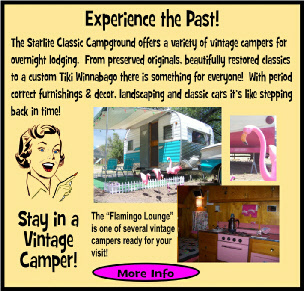 Now you can make your own memories in that style of trailer or choose one of the other vintage models offered for rent. Schedule your vacation today using the easy online reservation system. For those who prefer their own RV, there are shady, level pull-through spaces, complete with a million-dollar view of the surrounding mountains. 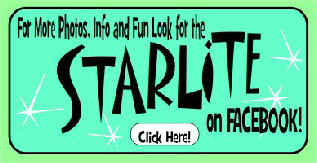 The Starlite Campground will meet the needs of every guest, with tent sites, both basic and with electric, and cozy cabins that sleep up to six people. Restrooms and laundry facilities are clean and convenient. Choose a souvenir commemorating your visit at the gift shop, stocked with retro and vintage items. The camp store also has firewood, ice and necessities. 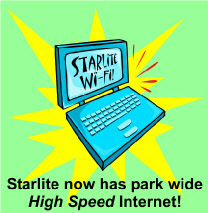 The Starlite Campground is just west of Canon City, two hours from Denver and 45 minutes from Colorado Springs. A mile away is the spectacular Royal Gorge Bridge, the highest suspension bridge in the country. At the bridge is a park with rides, shows and attractions. For a scenic view of the gorge and the Arkansas River, board the historic train that makes a 24-mile trip. An exciting aerial view can be seen on the Royal Gorge Zip Line, reaching speeds of more than 40 miles an hour. Go deep underground for a gold mine tour in Cripple Creek, or go for a jackpot at one of the local casinos. Take to the water for an exhilarating white-water rafting adventure. For those that enjoy shopping, we are only minutes away from Florence, the antique capitol of Colorado! Come Visit us soon! Our 2017 season is from May 5th through September 4th. 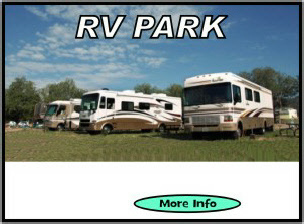 We are a full service RV Park with 30/50A service. Big Level Pull Thrus can handle the biggest rigs. Fantastic Views! Cabins available, accommodating up to six. Tent sites too... Both primitive and with electric! redistribution or reproduction of any material herein is strictly prohibited. 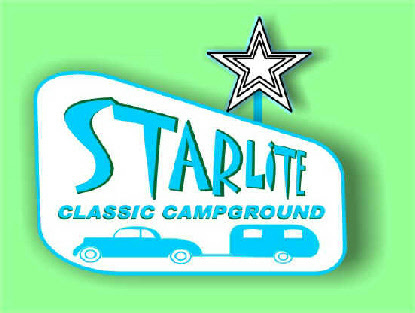 The Starlite Campground is CLOSED for overnight guests. 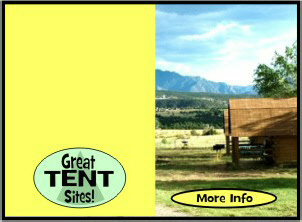 We have 30A and 50A RV sites available for a minimum of a 30 day stay. Units must be fully self contained as our restrooms will not be open. Application with background check is required, call 619-467-3876 or email HERE for more information. Sites include water, sewer, Wi-Fi, trash and the million dollar views! Electric & propane available but not included, user pays actual usage amounts. We DO NOT have vintage trailers, cabins, tent sites or overnight RV sites available. The store and pool will not be open.